This recipe is rich. Like, ‘whoa, look at all the different oils in there’ rich. But trust me, your skin will love it. If you haven’t started slathering your face with oil then now is the time (coconut oil is an excellent gateway to this). Then you can try other amazing oils for the face. 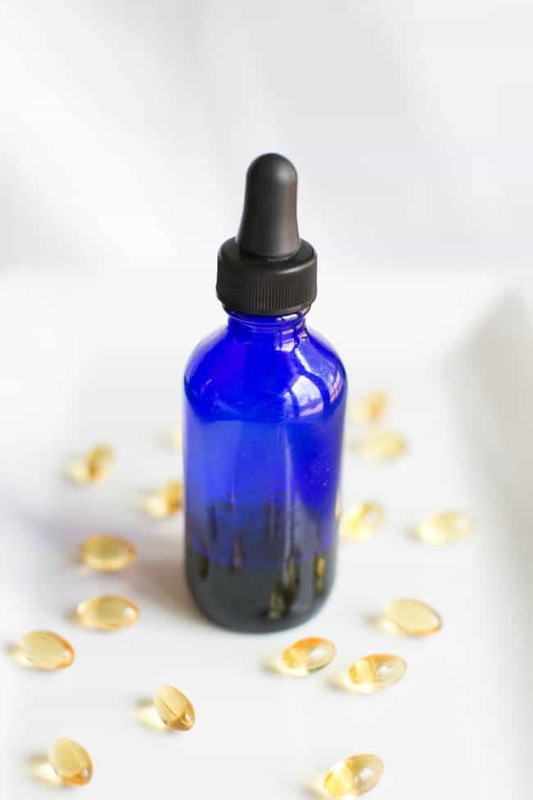 Rosehip seed oil is high in essential fatty acids that heal dehydrated skin. A “dry” oil, meaning that it soaks into the skin easily, it doesn’t leave a greasy residue, works wonders on scars and is the predominant oil used for treating wrinkles and premature aging. This recipe, courtesy of Dr. Axe, is ideal for aging skin. Facial oils, especially anti-aging ones, can be super expensive. Why not take that money to buy these ingredients and make your own for years to come? But if you don’t have or don’t want to buy all of these oils, it’s fine to leave them out. A simple combination of jojoba and rosehip seed oil would be a wonderful facial oil. Jojoba oil a super hydrating oil that closely matches the oil our skin produces so it won’t clog pores. Pomegranate seed oil and carrot seed oil both provide powerful antioxidants that repair damage done to your tissues by oxidants (free radicals) and protect skin from wrinkles. 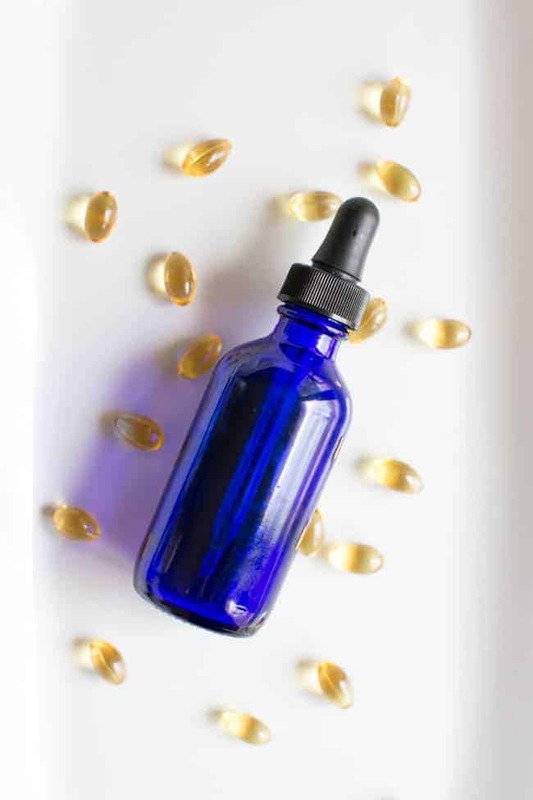 Evening primrose oil, an omega-6 essential fatty acid, has long been used to heal bruises and treat skin conditions like eczema. It’s now a common dietary supplement. Frankincense essential oil in skincare products can help treat dry skin, reverse signs of aging, and reduce the appearance of stretch marks and scars. The recipe makes about an ounce because a little oil goes a long way. Use a dark colored bottle with a dropper to make it easy to get a couple of drops at a time. And for best results keep refrigerated. Combine ingredients in a small dark-colored bottle. Shake gently to combine. Apply 2-4 drops to the pad of your finger and massage into face, neck and chest each night. Thank you. But am l to use the oil on my night moisturiser or before the moisturiser.? I thought this would be about making rose hip seed oil, not buying it from Amazon. The title is a bit deceiving. I’m going to try this one!! Thank you! Good thing there is no almond oil. I am allergic to that and I will definitely try making this DIY facial oil. Thanks for the recipe. 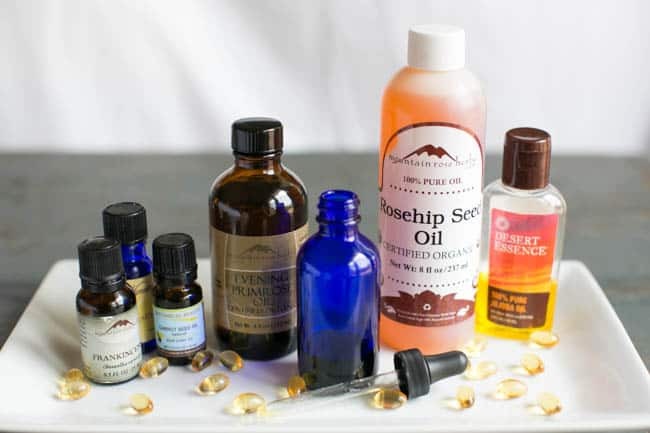 I was searching for how to make rosehip oil at home, since lots of people such as myself have rose bush/vine/plants at their home. This was one of the first search results, and the title kinda sounds like you are going to learn how to make it, but this is actually just instructions on how to buy a bunch of things at the store and mix them together. That is also swell, but definitely lower on the “make your own” scale. Without setting up a still and all that, is there a good easy way to extract/infuse what you want out of your rose buds/hips? Is there an ideal base oil that you can use as a solvent to dissolving other botanical oils like rose hips into (and then just press it out of the plant material through a strainer)? Shoot, I can’t edit my grammar mistakes from my last comment! Hey Adam, I’ve never experimented with extracting oils so don’t have any advice there. The only thing I’ve tried is infusing oils, which you could definitely do with dried rose hips. This recipe looks amazing! I am curious to know how you keep this oil in the refrigerator but still incorporate it into your daily beauty routine? Thanks! I have never tried out rosehip-seed oil until now. But I’m a big fan of doing facial oils and hair treatments so I put it on my list now together with grapeseed oil. Thanks for the recipe, can’t wait to try it out. Your blog is wonderful and super-interesting! Ah, what a wonderful idea and great post so well explained and gorgeous pictures.